This is the time of year for visiting family, spending time with loved ones, and being thankful. Help us at Fleet Feet spread the love and spirit with those in need. We are supporting Home Sweet Home Ministries and their Give Thanks campaign. 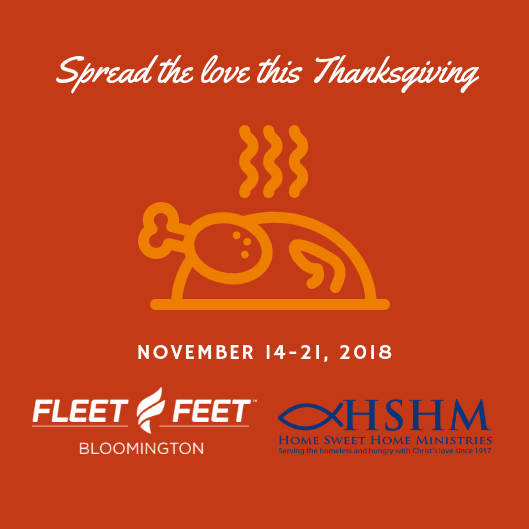 As part of the Give Thanks campaign, Home Sweet Home Ministries plans to distribute 2,000 Thanksgiving meal boxes, 600 home delivered meals, and 150 in-house meals. Plenty of people are in need this holiday season and could use your support. Making a $15 donation (cash/check) at Fleet Feet or Home Sweet Home (bring receipt to FF) for the purchase of a turkey. Home Sweet Home Ministries is located at 303 East Oakland Avenue in Bloomington. Drawing will be at the close of business on November 21 and will be announced in our Black Friday Weekend Facebook Event.